24 April, 2018 - “Literature is a luxury; fiction is a necessity,” G.K. Chesterton once said. He was right and still is today. The genre of fiction has evolved so much that, like Tim O'Brien puts it, it “…gets at the truth when the truth isn't sufficient for the truth.” In fact, it is the most read genre of books with its diverse variations like Children’s fiction, Young Adult fiction, Historical fiction and the likes, with many authors springing up everywhere as the genre continues to grow, and their beautiful styles competing for places in readers’ hearts worldwide. Digital Marketer Aurindam Ghosal is an ardent reader of literature and fiction who, ever since his childhood had a deep passion for the arts and story-telling mainly in the form of drama and short skits. His extensive reading over the years ultimately inspired him to write his first historical-fiction ‘The mystery of Alexander’s casket’, his breakout book into the world of fictional storytelling, which he wrote using his experience from being a student of Economics, Psychology and Business Administration. Aurindam put all his interests – History, Epics, Fantasy, Ancient Philosophies and Romantic Drama – into this book as he spent one year only for the research of this book. The book is a story of the battle for the mysterious casket of Alexander, an esoteric casket gifted to him by Kalanos, a mystic monk of Taxila which held the secret of the ultimate power which could be only opened by the ‘chosen one’, and the adventures of Kanishka, a Kushan prince who, in seeking to win the heart of Udyati, the princess of Avanti on the command of the Emperor Vima Khadapises who sought to annex the kingdom of Avanti through a matrimonial alliance, undergoes an adventurous, soul-searching exploration where he comes upon the mysterious casket in the possession of a Buddhist monk named Asvaghosa. Novelist and screenwriter Michael Cunningham once said, “One always has a better book in one's mind than one can manage to get onto paper.” But with this, Aurindam has shown that any book in one’s mind can be put into paper, or in this case, e-pages. 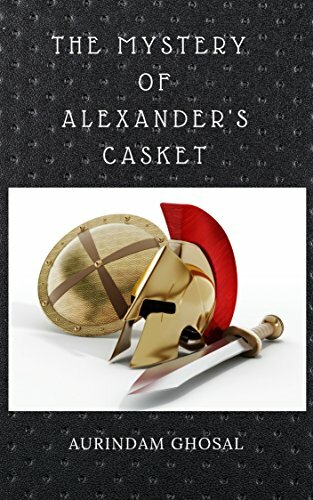 The book, ‘The mystery of Alexander’s casket’ has been launched on Amazon since the 16th of April and is targeted at fiction book lovers, particularly ebook readers.